Collector's edition and preorder bonus also revealed. 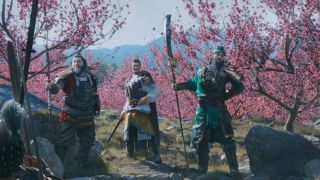 Total War: Three Kingdoms has a release date: March 7 2019. Preorders are up, and they come with the Yellow Turban Rebellion pack. In addition Sega has revealed digital, limited and collector's editions. Will one of them feature a statue that's too big for your desk? Hmm, I wonder. The collector's edition comes with, ah yes, a "weighty resin statue of the legendary hero Guan Yu". It's 24cm tall, so that's almost a full foot of Guan Yu for you. Sega's press release says that "in death he ascended to the heavens and earned godly status". I'm sure this memorial is what he would have wanted. The collector's edition comes in a chest that holds an art book, a special case, a double-sided poster showing the Warlords on one side and the campaign map on its more useful side. Meanwhile the limited edition comes with the limited edition case, double-sided map and the Warlord poster. The Yellow Turban rebellion pack that comes with pre-orders unlocks three playable warlords for the grand campaign. They serve as new hero classes: Scholars, Healers and Veterans. As part of the rebellion against the Han dynasty you get to lead bandits, zealots and commoners against the Han empire. Enjoy a taste of their righteous fury in the trailer below. The strong hero focus might be anathema to fans of historical accuracy, but I really enjoyed what I played of Three Kingdoms in the run up to Gamescom. When two heroes initiate a duel nearby warriors respectfully form a circle. The first modder to make them chant "fight! fight! fight!" while this happens will earn ten PC Gamer favour points.